Hi! I'm back from my unintentional blogging break to start catching up and sharing. Thanks to those who "noticed" I was missing!!! I will be posting lots of miscellaneous "stuff" in order to catch up, but the most timely as of now is that tomorrow (ready or not!) is December 1st and for many the official countdown begins!!! I don't know what is wrong with me, but I am stuck somewhere between LOVING that my kids are getting older, i.e. they pick out their own clothes, do their own homework, dress themselves, can make their lunch, and they never ask how many days until Christmas, AND WISHING they were still little, I picked out their cute outfits, dressed them, made fun lunches, help them with their homework, and constantly asking how many days until Santa comes!!! I think the holidays make these changes more obvious -- even starting with Halloween!! I recently found myself spending way too much time trying to find an "Elf on the Shelf" on the internet for less than $30. I soooo badly want to pose that bad boy around my house for my kid's amusement. Oh, do I have some ideas!!! But wait, hold the bus!! My kids are 15 and 12 1/2....is this really the time for me to jump on the Elf on the Shelf bandwagon?? Probably not. However, if I can get my hands on that little Elf for $20 -- I will !!! The other thing I miss about not having younger kids... Older kids "know" everything. If they happen to see me printing a sheet with numbers on it. "Oh, is that for Christmas??" My daughter is on Pinterest. Sometimes I forget this... "Oh, are you going to make that thing on Pinterest?" They also use the computer that you might have typed some Christmas activities on. "Oh, I saw that list of Christmas stuff we are going to do!" Gone Almost gone are the days when I could surprise them easily. Ya know, put their Christmas presents in the shopping cart right behind their head. Or, "look, there's Santa" while you do your miscellaneous secret stuff. Then there's the whole "how many more days until Christmas"?? We have had a Christmas countdown tree for years. It's a tree with numbered pockets down below and Velcro ornaments for each day. The kids have always liked it. I like it, too, but it's kind of outdated looking. I've tried to spruce it up with some newer ribbon, but to me it still screams "90s". I also know that Christmas is all about traditions, but I really didn't want to hang that bad boy up again. Oh, and I do not have a circle punch, so I just simply cut out my numbers. Keep in mind that depending on how many kids you have, the candy has to be fairly small to fit inside the tins. If you have a million kids, ya might have to go with M&Ms!!?? Yet, in spite of all of that, I whipped up this little countdown simply because I thought it was fun and even though the kids already know that there's candy inside, are old enough to count it down themselves, and saw my typed up list of Christmas surprises along the way -- well, I will still feel good spreading some good old fashioned "Christmas Joy" with my big ol' kids this holiday season!!! How do you Countdown to Christmas -- are ya ready?? If you have been following along, you may remember I mentioned my husband painting our family room. In fact, I said I "tricked" him into it. Ha! He later said, "ya know I read your blog". I must say, my "painter" has been quite diligent. The room has been in a bit of chaos for two weeks, however, it is now relatively put back together. If "my painter" can finish cleaning up and help me hang a few things back on the wall -- I may just hire him for the next phase of this painting project! In the meantime, thank you for taking on this project (and thank you for letting me share this with all of you in hopes that my husband reads my blog)!! Wink, wink. I know, my captions are backwards. Lighting makes SUCH a difference with color, doesn't it? *this is not a designer blog! Kristin and I made a delivery to grandma's Thursday night as I had received her monthly shipment of personal items -- and she needed them asap. My mom was not in her room. Kristin went to see if she was at dinner. She found her in the hall on her way back from dinner to her apartment...with "The Don". Kristin said "The Don" said he would let her visit with her company and left. I'd like to say (again) that Kristin is excellent with grandma. She tells her stories, shows her pictures, makes her charms for her key chain. 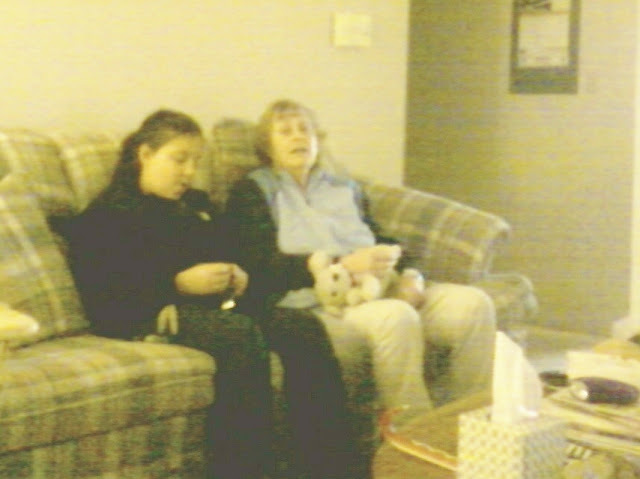 She has always been good with grandma. A few years ago, Kristin would call grandma and just talk and talk, because she knew grandma would love to hear every detail of everything and Kristin is good with details. While visiting, I was a little apprehensive as it is unusual for us to visit in the evening hours and typically my mom is more agitated at that time. However, my mom did not seem too bad. She repeated the normal things that she does, but also told us about a fire drill they had and told us how much it scares her and the residents. She doesn't think they should have drills because she says nobody will believe it when the real fire comes. I reminded her to assume that all drills were "real" and head for the Exit. Kristin told her they have them at school, too and explained it to grandma. I shudder to think what would happen and would probably be mortified if I saw what happens during the drills. Since my mom seemed fairly coherent, I decided to let her know that my childhood neighbor friend had lost her husband to cancer. We were close friends with her and her family growing up and my mom was great friends with her mom. To my surprise, my mom began to tear up when I told her, which made me cry. Why, you say? Well, because one of the many changes I have seen in my mom over these last few years is her almost total lack of empathy. I have not seen her cry actual tears in a long time. I remember when her close neighbor, Ginny, passed away. Ginny was an older lady my mom actually used to help take care of. This was before my mom was formally diagnosed. My mom did not cry, but she did keep repeating that she died and called me several times to tell me the same thing over and over. I knew this was not normal for my mom. I used to tell my mom things on the phone that I thought she would be shocked to hear or upset about and her response somewhere along the way became "huh". Not, "Oh Cindy, that's terrible" or not a "gasp". Just a pause and then "huh". At the time, It made me mad. I would say, "that's it, just huh"? I used to share all kinds of things with my mom. I haven't been truly able to do that in years. So, back to Thursday when I shared this news with her. Her face crinkled up close to tears...I teared up...and then just as fast as she almost cried she instantly said, "I heard your dad moved again". So close, and yet so far. I laughed through my (almost) tears. Kristin understood. If your mom is still someone you are able to share "things" with, (or maybe it's your sister or grandma), you may not realize how lucky you are! Girlfriends are great, but your mom is your mom!! This past week, as a promise to myself, I wanted to commit to making dinner for the family every day. I know, that's the way it's supposed to be, right? However, this was the first full week that all my kids were done with outdoor soccer (yes, now indoors), volleyball, football and marching band and the reality is dinner has been a crazy scramble the past two months as nobody was home at a normal dinner time. I also wanted to prove to myself that I was "pinning" those Pinterest recipes for a reason, so I decided that would be a good resource for my meals. What I didn't take into account was that my kids did not have school on Tuesday (Election Day) and that Wednesday and Thursday evenings were parent teacher conferences. This was going to make preparing meals and eating them as a family tricky. Thus is our life -- dinner time interruptus. The reality is -- there's always gonna be something!! I'd also like to give a little shout out to my new Cuisinart Smart Stick (emulsion blender). I guess I've been living in the dark ages and did not have an emulsion blender. It's my new love and the possibilities with it are endless!! Highly recommend -- it's a food processor, blender and more!! * Does everyone else already have one? (Time for another bridal shower!!) Smoothies without cleaning a blender...yes, please! (In full disclosure -- I took pictures of all of my meals and then just now got "delete happy" and deleted all but one of them (the last one). Soooo bummed about that! Monday: Chicken and Cheese Lasagna Roll Ups as found here. Comments: In my opinion, this could use more Italian spices. I added garlic and oregano, but it still could have used more. It was little bland for me. I also put leftover chicken mixture on top of each rollup and replaced feta cheese with shredded mozzarella. Served with: Caesar salad and fresh bread. Comments: I used some salsa we had leftover. I didn't even check how spicy it was. Turns out it was medium spicy and a little too spicy for me and my kids. Might want to keep that in mind when you are making yours. Served with: Mashed potatoes, gravy, and french cut green beans. Review: Everybody ate it. My husband liked it the most. He's a meatloaf kinda guy. Kids thought it was too spicy. I thought it was good...for meatloaf. Fast cooking time was nice. Moist and flavorful. Comments: This was a recipe I went in search for. There is a local restaurant which has excellent carrot chicken soup. If it doesn't sound good to you -- well, you might be surprised. Be careful not to over blend. The recipe does not call for any spices. I added salt and pepper, but it probably could have used a little something else (I'm not sure what). However, I was surprised how much it looked like the restaurant's soup and tasted good, too. Lots of chopping! Reviews: Everyone liked it but would probably rather go to the restaurant. Comments: This was another conference night, but I was able to prepare this in advance and pop it in the oven when we got home. I love that this uses rotisserie chicken. I only put mushrooms on one half of the casserole as, unfortunately, I knew my kids would not touch the mushrooms. If I make it again, I would probably add another 1/2 cup of marsala wine and heavy cream. Reviews: This was very good and probably the overall family favorite of the week (thanks, Kerri)!! Friday: I was happy to take the night off. We had Megan's band banquet. Oh, and by "week" I meant weekdays -- you didn't think I would actually cook seven days in a row, did you?? What are some of your favorite "go to" dinners?? Yes, I have followed through on my goal of cooking my dinners from Pinterest recipes this week! Probably be sharing that tomorrow. You know how it feels when you get your "hopes" up...and it doesn't work out? The Tigers, the Presidential race. That's life, right? My "painter" (husband) is heading towards our third weekend of our family room being in shambles...I hope he gets the trim done this weekend so we can put the room back together. Proud of all three of my kids report cards the first marking period. Everyone has a 3.5 GPA or above. Megan is taking two AP (college level) courses as a sophomore...intense! With their extracurricular schedule...it is amazing what they were able to accomplish!! Apparently, I had a lot on my mind, but now I'm off to conferences. I Behaved at the Target Halloween Clearance!! I knew there was nothing I "needed" at the Target Halloween clearance (which was at 70% off Sunday). However, I am always curious!! There is one near my mom's place, so when we visited we swung by. There was a decent amount of stuff, but it's always better when your kids are younger... Mine aren't. Definitely a good time to get some of your candies for holiday cookies!! 90% off should be right around the corner!! I was running errands Halloween morning and was kind of in my mom's neighborhood deciding whether to drop off another "ration" of her personal hygiene items... I was thinking how I was surprised she had not called needing more and it had been a week. But then, I reasoned, there is always the "secret package" I hid away in her drawer. I decided to make a quick visit. When I arrived, my mom was not in her apartment. This ended up being a good thing as I was able to do my quick "clean up", i.e. throwing away the week's worth of pill cups, placemats, junk mail, etc... I was a little surprised to find that the "backup" secret package of disposables was no longer in her drawer. It is quite possible the staff located it for her in her "time of need", but I guess it is also possible she "found" them herself. Who knows. (For those that are lost and/or find this "tmi", I am referring to the fact that my mom "changes" apparently more than she should and is going through personal hygiene items faster than I can keep up with.) Bottom line, it was a good thing I stopped by as she was almost "out". I left another package with a note that said, "Happy Halloween". I also took the opportunity to replenish the nice lady down the hall's "Dum Dum" supply. She keeps a ceramic apple on the shelf outside her door and fills it with candy. Usually Dum Dum suckers. Well, my mom takes more than one each time she passes by. When I am with her, I either make her put them back or tell her "only one", reminding her she has some in her apartment. Yes, my mom has become my unexpected fourth child (and if you include my husband and the dog...6 kids!) I have also since come clean with the nice lady who probably runs out of suckers every couple of days. I was able to refill the entire big apple on what my mom had "squirreled away" in her apartment. I believe my mom was in the dining room watching them set up for their Halloween lunch feast. I peeked in and saw the cute Halloween set up they were working on, but didn't have the chance to "find" my mom. On another note, my mom has mentioned a few times how one of the ladies at her dinner table has "tremors" and my mom says she helps her open her butter and butters her roll every day (without her even asking). I have met this lady before and I believe she may have Parkinson's and it is sad to watch her try to eat with the tremors she has. I can tell that my mom feels good about being able to help her and she says so. That is another great thing about being in this senior community. They all seem to know what each other can or cannot do...and they help each other, or get help for each other, or point each other in the right direction every day, and even "tell" on each other. I am grateful for that! Yesterday, me and two of the kids made a quick visit for our last "ration". She was, as always, glad to see us -- especially the kids. She again asked Kristin what grade she was in. When Kristin says, "7th" my mom always says, "oh, boy time"! Then, as she usually does, she asks Jacob if he has to bring a baseball bat to school -- to keep the girls away from him. We all get a laugh out of it -- partly because my mom thinks it is so funny, and partly because we always know exactly what she is going to say!! Such is life this week with mom...now I have to go pay her bills!! I wasn't going to post about Halloween 2012. My kids are older...the cuteness is somewhat gone. We barely carved two pumpkins...on Halloween day after school. However, at the last minute ALL of my "kids" decided to go trick or treating. The only one who planned to all along was Kristin, the kitty cat. I did not make bloody finger cocktail weenies, or float an iced hand in punch, or bake pumpkin seeds...or any of those things. I was actually a little embarassed shocked that my 15 year old went out. I am quite sure this was finally her last year. She knows I thought it was a bit much...and only a very small percentage of her friends went. Thus, the last minute "costumes". We had a total of 25 kids at our door this year. Ever since they built subdivisions adjoining ours...with sidewalks and houses closer together...everybody goes over there. More bang for your trick or treat mile. Plus, we live in a cul-de-sac so apparently nobody wants to bother much anymore... When we moved in 15 year ago, we got over 100 kids...everybody's growing up!! It was a pretty quiet and subdued Halloween. I drank my Witches Brew wine and had some leftover Fritos. The years of school parties, passing out the cute little favors I used to put together, putting major thought, planning and money into costumes. Well, those days are over. I would like to have a Halloween party for some of the kids next time Halloween falls on a Friday. Movies, treats, costumes,carmel apple bar, bonfire kind of thing. That would be fun!!! What age do you think is too old for trick or treating? I remember wanting to give a midget tootsie roll to the big high schoolers who just wore their football jerseys... Now that my kids are older...I kind of get that some of them want to drag out their childhood as long as possible. Who am I to say?? Megan, the 15 year old Cowgirl...? To Me, this just says "I want CANDY!" Mr. Living...and his "Lucky" dog! As I am sure I eluded to at least once when Jacob had two a days in the summer, he went out for the football team this year for the first time -- 7th grade JV football to be exact. He had played "flag" football in elementary school and that was it. It is definitely a commitment. A few weeks of practices during the summer, several hours each day. Then, practice right after school five days a week getting home after 6 pm. One game per week, getting pulled out of school early to prep and/or travel to away games. All the while, showers, dinner, homework, practicing the trumpet. Trying to head to bed by 9 pm...but many times later. Jacob played mostly Left Guard Offense and Left Tackle Defense. I know that because I just asked him. Unfortunately, with the girls schedule almost always conflicting with Jacob's football schedule, I was only able to get to maybe 2 1/2 games. Of course, they were the freeeezing cold ones!! My husband picked up from most practices and attended all of his games. I was usually at a volleyball game and/or taking Megan and Kristin to soccer practices and marching band practice. 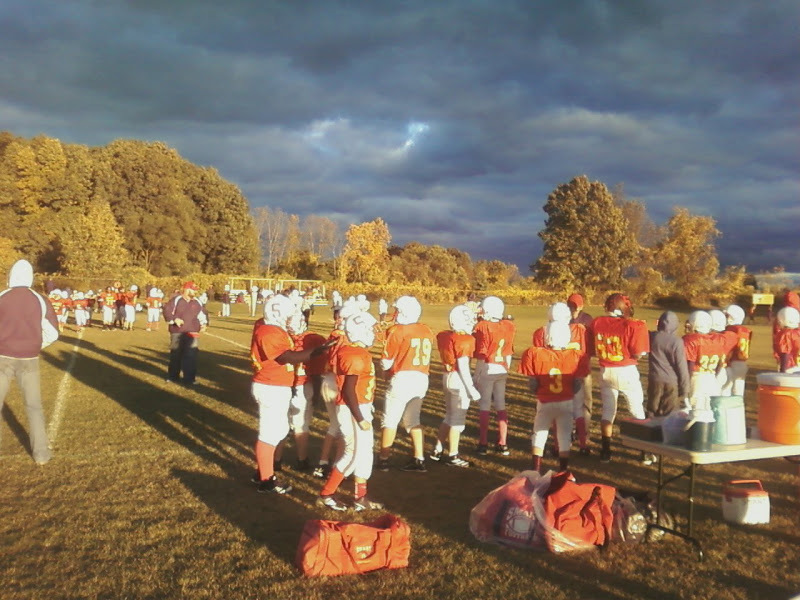 A freezing cold game day -- creepy sky -- don't let the peek of sun fool you!! In the end, I think Jacob did really great! I saw him make some tackles, and he truly seemed to love the camaraderie that goes along with the football team. The "team" eats lunch together at school and seems to support each other on and off the field. I think that is just as important, if not more, than the games themselves. He also seemed to LOVE the "role" of wearing his game jersey to school on game days, a tie for away games, and his jersey for the high school football games while "milling around" with his teammates during those games. Again, I do not know their record. I know they won some games, and lost some games. I know I am proud of the commitment and discipline that it took and that Jacob kept up with his schoolwork without complaining. We actually had our football banquet before the season was over, since the district ended up adding one more game post season. It was fun to see Jacob enjoying his teammates. He made some new friends that I had never met before, and I frequently heard "the guys" calling his name when we were out and about. Me and his sisters loved saying , "Hi Jakeeeeee" in front of his teammates and watching him try to be mad, but seeing him crack a smile!!! 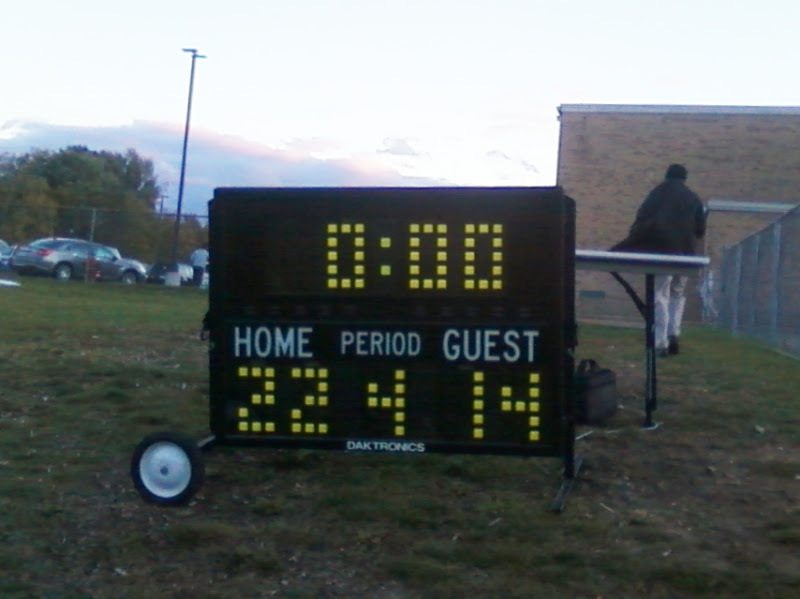 Snapped a picture of the winning scoreboard while running to the car for warmth! The Last Game...only time both sisters could make it. October 29th -- Hurricane Sandy was well on her way...even in Michigan...COLD AND WINDY!!!!!! Father-Son Coming Back to the Car -- Which I Was Already Warming Up!!! The JV Guys -- Hooray!